Washington Square Park in Greenwich Village, is one of New York's best known parks. Now surrounded by New York University buildings, it once was home to artists and studios. Originally a farmland, in the early 19th century, it was used as a burial ground for yellow fever victims and unknown or indigent people. It is estimated that the remains of more than 20,000 bodies rest under the park to this day. Washington Square Park has always been an open space with a tradition of nonconformity. The park has hosted its share of political rallies and riots. Labor, suffrage and hippie movements have used the park as gathering grounds. Literary greats such as Edgar Allan Poe, Walt Whitman and Mark Twain, and numerous other artists have resided in the area surrounding the park. 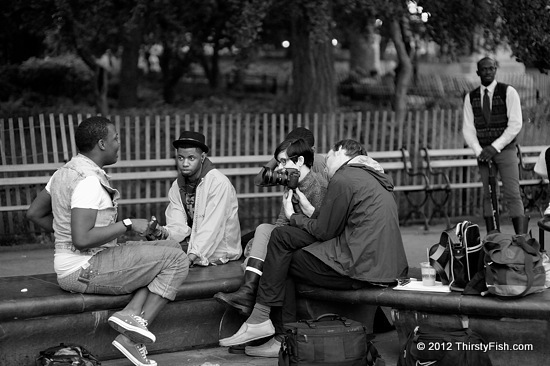 Artists, writers, photographers, activists and chess players continue to meet in the park and interact. The tradition of Washington Square Park carries on. While the Occupy movement was holding lectures, workshops and discussions before their solidarity with Quebec students march, this team of students was conducting a video interview at another section of the park.